4 separate apartments with 6 bedrooms/6 baths. Sleeps 12 adults plus children. 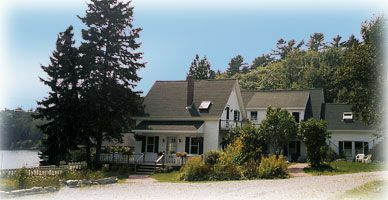 Coveside House, a Sea Captain-style home overlooking Decker's Cove, is located at 41 Hendricks Hill Road, on beautiful Southport Island on the coast of Maine, just an hour's drive from Portland, and minutes from Boothbay Harbor. This coastal home is approximately 200 years old having gone through several transformations and uses, most recently as four separate apartments. Currently, this property is rented as a single home comprising four independent suites of rooms, each with a living room/sitting area, kitchen, bedroom(s), bathroom(s), etc. This layout is ideally suited for family /group gatherings as it provides for communal togetherness in one of the larger living spaces, but also independence. The six (6) bedrooms comfortably accommodate 12 people plus more space for children. The outside comprises a large garden with picnic area/BBQs, and a dock with kayaks for exploring a variety of interior and open ocean waterways. All this, and Boothbay Harbor with its restaurants, shops, and harbor/ocean tours. Other Amenities: Dock with 2 Kayaks provided for the renter's use . House has comprehensive central heating, and is provided with all house keeping consumables except food and drink . Discerning cooks will find the kitchens well equipped ; one of the living spaces ( suite 1 ) has a washer/dryer; and, all have up to date cable TV and Wi-Fi connections. Apt 3 ( suite 3 ) is on the ground floor with wheel chair access and appointments to facilitate the day to day living of the physically handicapped...also, wheel chair access is provided between this living area and suite 1/ apt 1, which usually serves as the communal gathering place. The premises also provide for ample onsite parking, which in the past has accommodated a RV and boat with trailer, plus cars. Boat launching facilities are near by, as is Robinson's Wharf Pub/Restaurant...2 minutes walk from the rental. open ocean/ tidal river/ inter island waterways for kayaking, and sailing. Also, golfing walk-ons are usually accepted at the local golf club which also has a variety of eating facilities that are open to the general public. . The Southport yacht club has an excellent sailing school...min age 8yrs; min enrollment 1 week , and tennis courts with a resident instructor, are available at nearby Juniper Point, which also has an impressive Aquarium. Also, the area has one of the best Botanical Gardens in the country...a real treat for young and old alike . We are Jane and Inder Cheema. Retired from ExxonMobil in 2000, which is when we established permanent residency on Southport in a home that we have had since 1978. We both immigrated to the US, Jane from Canada, and Inder from Kashmir, India, so Southport is special to us...it was our anchor during the many years of living and working overseas, and is now a summer base for children and grandchildren, and our year round home. Close to our home on Southport; sounded like a good retirement project, which it was and continues to be. Away from the hustle and bustle of Boothbay Harbor, but close enough for convenient access if and when desired. Dock at property provides safe boating within protected Decker's cove, but also convenient access to a variety of adjoining interior and open ocean waterways. Bathroom 1 and 5 are downstairs. All bathrooms are close to or adjoining bedrooms, with the exception of bathroom 1 which is on the ground floor and adjacent to a large living room. Two miles from Coveside House, on Southport. The property is at Deckers Cove on Southport Island, with dock and two ocean going kayaks which are available for guests to use in the cove or adjoining open ocean/interior waterways and islands. Southport...on the west side...post office, fire house, a general store, and an excellent restaurant at nearby Cozy Harbor. The library is further along, in Newagen. Decker's Cove...adjacent. Refer aerial photo. Dock on Deckers Cove, across the road from facility .Access to the cove and open ocean. The entire facility is winterized. Sheets/towels/pillow cases...extra cost 100$, unless provided by renter. All other bedding and housekeeping consumables are provided. There are four, one of which is significantly larger than the others. In each of the kitchens. Each of the four kitchens has a 4 burner electric stove top, with oven. Spices, condiments, salt, sugar, vinegar, cooking oil, teas. Each kitchen is very well stocked. There are 4 separate kitchens, one of which is significantly larger than the other three ( refer photos ). There are 4, the largest of which ( refer photo ) has a dinning table that has extra leaves which when installed can seat 10. Two...ocean going. Safety equipment/aprons provided. Just of the island at Juniper Point. At the Boothbay Harbor Country Club. Just one suite of rooms that are on the ground floor. Tub in bathroom has handles but does not have opening for wheelchair. This is a 140yr old home which has been through may uses and alterations, most recently available as 4 independent apartments. In its current form as a 6 bedroom/6 bath contiguous home, it is unique in that it still has several living rooms with TV and Wi-Fi and fully equipped kitchens which can be viewed as being part of a suite of rooms, each with its living room, kitchen, bedroom ( s ), and bathroom( s ) . This provide for independence , but also togetherness in the larger communal areas....one of the dinning areas with a large kitchen, can seat 10-12 people ( refer pictures ) . Great house, room for a large family holiday. Our group of 18 (10 adults and 8 children) thouroughly enjoyed our stay at Coveside House. It was a great place to gather to share time together while playing games, cooking meals, or relaxing by the firepit. There is an awesome beach just down the road on Southport Island and a cute/well stocked general store. There is also a terrific lobster spot (Robinson's) within walking distance. Coveside is close to so many cool attractions - we would highly recommend the Aquarium and Botanical Gardens! Mr. Cheema was a wonderful host! We would definitely choose this property again! We easily fit 16 people on the various rooms. The house was clean upon our arrival and the owners were quick to respond to any queries we had prior to our trip. Loved it! A perfect house for grandparents,parents, aunts, uncles and cousin to vacation in. We were able to spend quality time in common space yet each family had their own suite to escape to for quiet time. Highly recommend. We could not have been more pleased with the property. Hendrick's Cove was a delightful spot for our family vacation. Property must be left reasonably tidy and clean. A 25% deposit is required with the reservation. In general, a full refund is given if a cancellation is made within 3 months of the occupancy date. Refunds for shorter cancellations periods will also result in a full refund if the property can be re-rented for the same time period as the original reservation. The linens charge is optional.